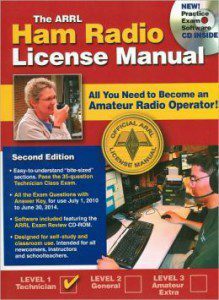 Becoming a “ham” (the nickname for an Amateur Radio Operator) unlocks many doors to a rich and rewarding hobby with countless and broad-reaching aspects (see ARRL – New to Ham Radio). But, in order to become a “ham” you must pass an exam from the Federal Communications Commission (FCC.) This is because being a ham carries with it some responsibilities and capabilities that users of other radio services such as Citizens Band radio (CB) and Family Radio Service (FRS) does not. CB operators can only use up to 12 watts of power – while Ham operators can use up to 1,500 watts on most bands! Whereas all other radio services are allowed only very few channels or frequencies to work with – Hams have literally millions! The first level of the Amateur Radio Operator is the Technician Class which allows you all ham radio frequency use privileges above 30 MHz, including the popular 2 meter band where many operators enjoy using small hand-held radios (called HT’s) to chat with other hams in their area. Technicians may operate FM voice, digital modes such as packet (computers), television, single-sideband voice, Morse code (CW) and several other interesting modes. You can even make international radio contacts via satellites, using relatively simple station equipment, or even through linked networks using D-STAR or linked repeater networks. Technician licensees now also have additional privileges on certain HF frequencies (below 30 mHz) including the 80, 40 and 15 meter bands using Morse code (CW), and on the 10 meter band using CW, voice and digital modes. Morse code is no longer required for any Amateur Radio license! The Technician Class License exam covers basic regulations, operating practices and basic electronics theory, with a focus on VHF and UHF (above 30 mHz) applications. Don’t let this scare you. You can do it! – Many folks from all walks of life (including children) routinely pass their Technician exams on the first try. There are a number of study materials available to help you pass the exam. Many people rely on the study materials from the American Radio Relay League (ARRL). They provide both study guides and a CD (ARRL Training and Education). One of the most popular and more intuitive study guides is published by the W5YI GROUP, Gordon West, (WB6NOA). Visit the ARRL or books sellers such as Amazon.com to purchase a Technician Class study manual. 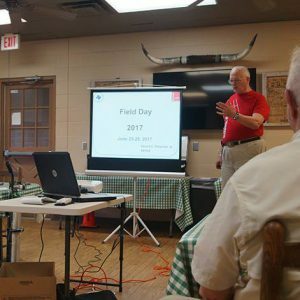 SARC’s Technician and General Classes meet for three (3) consecutive Saturdays while the Amateur Extra Classes meet for four (4) consecutive Saturdays. All classes end on the last Saturday with an official amateur radio licensing test session conducted by the Volunteer Examiners Committee of SARC. Additional training classes and testing locations are available by other local clubs, see Links page for their information. Once you are ready to take the real exam, check the our website or SARC Newsletter. To take the test you will need to bring $15 and two forms of ID, one of which will a photo ID… and that’s it (see the Testing tab for full details). The exams are never as hard as the new ham thinks they were going to be! They consist of 35 multiple-choice questions taken from a pool of only 400 questions. These questions are known, as are the answers. You can download the entire pool of questions from the ARRL and other sources. There are also several websites (e.g., Like QRZ or AA9PW) that have practice exams made up of questions pulled at random from this pool. You should sign onto one of these websites and repeatedly take the exam until you routinely receive a grade of 85% or higher. When you take the real exam, you will see the exact same questions. The answers may be in a different order, but they will be the same answers that you have already seen several times! Once you are routinely passing the online practice tests – consider studying for the next level up: the General Class License. Because, when you pass the Technician Class test you will get a FREE General Class test – and who knows? You may walk out a new ham with HF privileges! So, yes, you can do it! Allow yourself about three weeks for study. See our Testing tab or check Links tab for other clubs offering testing. The FCC generally takes at least two weeks to process the paperwork and grant you your very own “call sign” such as “K5AUW.” You will also receiver a paper license from the FCC in the mail as well as a page on QRZ.com. But how you will really “become a ham” is what happens afterwards. Though not a requirement – you will need to borrow or purchase an HT (hand talkie) for starters so that you will have folks all over your local area to talk to (on the air,) and you should attend or consider joining one of the local clubs. 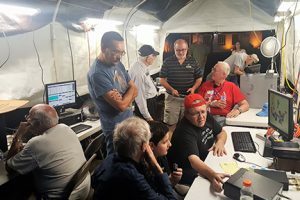 Though, definitely not a requirement for being a ham radio operator, your local club will be your ready source for helpful assistance and answers to questions, as well as opportunities to get real ‘hands-on’ practice with radio gear and operating procedure. Helpful mentors you will meet in the local club environment are called “Elmers” and even the most seasoned ham knows a few folks they consider an Elmer. 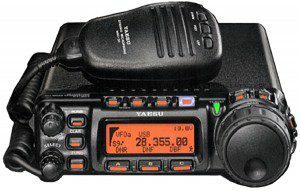 It is often said by new hams that they are apprehensive about asking other hams for help because they fear that their questions are dumb one… Well, there are NO dumb questions in Amateur Radio – only good one… believe it or not, it’s in our Amateur’s Code as well as in FCC regulation to place high regard in assisting and training up new hams. If you have any questions about becoming a ham – helpful and kind assistance is just an email away!